Part Time Punks presents the 1st-ever LA appearance of 1980s Cold Wave pioneers TRISOMIE 21…….plus PTP darkwave-faves SOFT KILL……and critically-acclaimed Canadian post-punk outfit ACTORS…This WILL sell out, folks. So grab yr adv tix NOW! 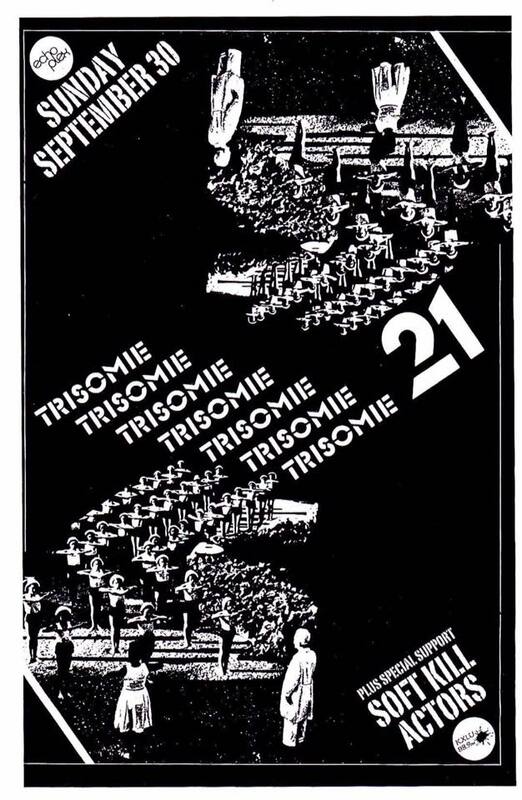 Centered around brothers Philippe and Hervé Lomprez, TRISOMIE 21 (often abbreviated to T21) are a French cold wave group who have endured since the early ’80s, spanning styles such as brooding, experimental post-punk as well as a more danceable synth pop sound. The two Lomprez brothers were initially joined by keyboard player Jean-Michel Matuszak (who also served as their manager) and bassist Pascal Tison, and their music was influenced by dark post-punk acts like Joy Division and the Cure as well as the experimentation of the Residents and Yello. Belgian label Stechak released T21’s debut mini-album, Le Repos des Enfants Heureux, in 1983. Bassist Laurent Dagnicourt replaced Tison for the group’s 1984 full-length Passions Divisées. Emphasizing the band’s rhythm section while keeping their keyboard-heavy experimentation intact, the album included the haunting “La Fête Triste,” which would emerge as one of their signature tunes. The Lomprez brothers secretly returned to the studio in 2017, with early member Tison contributing to some of the sessions. The full-length Elegance Never Dies was released by the group’s own Chromo Music Production by the end of the year, and the group toured throughout Europe in support of the album. Additionally, the American label Dark Entries released Chapter I-IV, a vinyl box set containing expanded editions of T21’s first four records, which were also reissued individually. The group also released a three-CD box set of early material titled Originally in 2018.